In the trading of assets, an investorEquity TraderAn equity trader is someone who participates in the buying and selling of company shares on the equity market. Similar to someone who would invest in the debt capital markets, an equity trader invests in the equity capital markets and exchanges their money for company stocks instead of bonds. Bank careers are high-paying can take two types of positions: long and short. An investor can either buy an asset (going long), or sell it (going short). Long and short positions are further complicated by the two types of optionsStock OptionA stock option is a contract between two parties which gives the buyer the right to buy or sell underlying stocks at a predetermined price and within a specified time period. A seller of the stock option is called an option writer, the call and put. An investor may enter into a long put, a long call, a short put, or a short call. Furthermore, an investor can combine long and short positions into complex trading and hedging strategies. In a long (buy) position, the investor is hoping for the price to rise. An investor in a long position will profit from a rise in price. The typical stock purchaseStock AcquisitionIn a stock acquisition, the individual shareholder(s) sell their interest in the company to a buyer. With a stock sale, the buyer is assuming ownership of both assets and liabilities – including potential liabilities from past actions of the business. The buyer is merely stepping into the shoes of the previous owner is a long stock asset purchase. A long call position is one where an investor purchases a call option. Thus, a long call also benefits from a rise in the underlying assets price. A long put position involves the purchase of a put option. The logic behind the “long” aspect of the put follows the same logic of the long call. A put option rises in value when the underlying asset drops in value. A long put rises in value with a drop in the underlying asset. To learn more, launch our online finance courses. In a long asset purchase, the potential downside/loss is the purchase price. The upside is unlimited. In long calls and puts, the potential downsides are more complicated. These are explored further in our options case studyOptions Case Study - Long CallThis options case study demonstrates the complex interactions of options. Both put and call options have different payouts. To study the complex nature and interactions between options and the underlying asset, we present an options case study..
A short position is the exact opposite of a long position. The investor hopes for and benefits from a drop in the price of the security. Executing or entering a short position is a bit more complicated than purchasing the asset. In the case of a short stock position, the investor hopes to profit from a drop in the stock price. This is done by borrowing X number of sharesStockWhat is a stock? An individual who owns stock in a company is called a shareholder and is eligible to claim part of the company’s residual assets and earnings (should the company ever be dissolved). The terms "stock", "shares", and "equity" are used interchangeably. of the company from a stockbroker, and then selling the stock at the current market price. The investor then has an open position for X number of shares with the broker, that has to be closed in the future. If the price drops, the investor can purchase X amount of stock shares for less than the total price they sold the same number of shares for earlier. The excess cashCash EquivalentsCash and cash equivalents are the most liquid of all assets on the balance sheet. Cash equivalents include money market securities, Bankers Acceptances, Treasury bills, commercial paper, and other money market instruments. is her profit. – You put up a margin deposit as collateral for your brokerage firm to loan you 100 shares of the stock, which they already own. – Now assume that, as you anticipated, the stock’s price begins to fall. A few weeks later, the price of the stock has dropped all the way down to $30 a share. You don’t expect it to go much, if any, lower than that, so you decide to close out your short sale. – You now buy 100 shares of the stock for $3,000 ($30 x 100 = $3,000). You give those 100 shares of stock to your broker to pay him back for, replace, the 100 shares he loaned you. Having paid back the 100 share loan, you are no longer “short” the stock. – You have made a $2,000 profit on your short sell trade. You received $5,000 when you sold the 100 shares your broker loaned you, but you were later able to buy 100 shares to pay him back with for only $3,000. Thus, your profit is figured as follows: $5,000 (received) – $3,000 (paid) = $2,000 (profit). Short stock positions are typically only given to accredited investors, as it requires a great deal of trust between the investor and broker to lend shares to execute the short sale. In fact, even if the short is executed, the investor is usually required to place a margin deposit or collateral with the broker in exchange for the loaned shares. Short call positions are entered into when the investor sells, or “writes”, a call option. A short call position is the counter-party to a long call. The writer will profit from the short call position if the value of the call drops, or the value of the underlying drops. Short put positions are entered into when the investor writes a put option. The writer will profit from the position if the value of the put drops, or when the value of the underlying exceeds the strike price of the option. Short positions for other assets can be executed through a derivative known as swaps. A credit default swap, for example, is a contract where the issuer will pay out a sum to the buyer if an underlying asset fails or defaults. 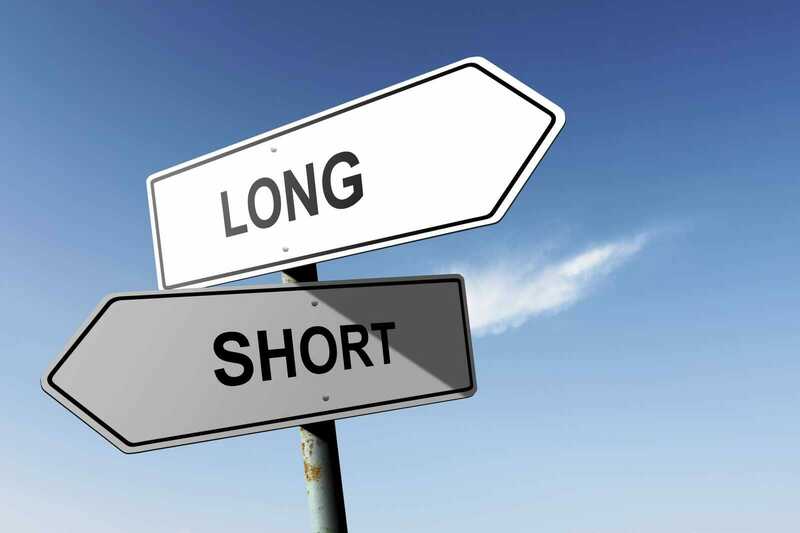 There is a wide variety of long and short positions that traders may adopt. A knowledgeable investor will have grasped the many advantages and disadvantages of each individual type of long and short positions before attempting to incorporate using them in his or her trading strategy. Aroon IndicatorAroon Indicator - Technical AnalysisThe aroon indicator uses the aroon-up and aroon-down calculations to identify the beginning of a new trend, or a changing trend in the market. It can also be used to identify ranging or consolidating markets, or to gauge the strength of a trend.